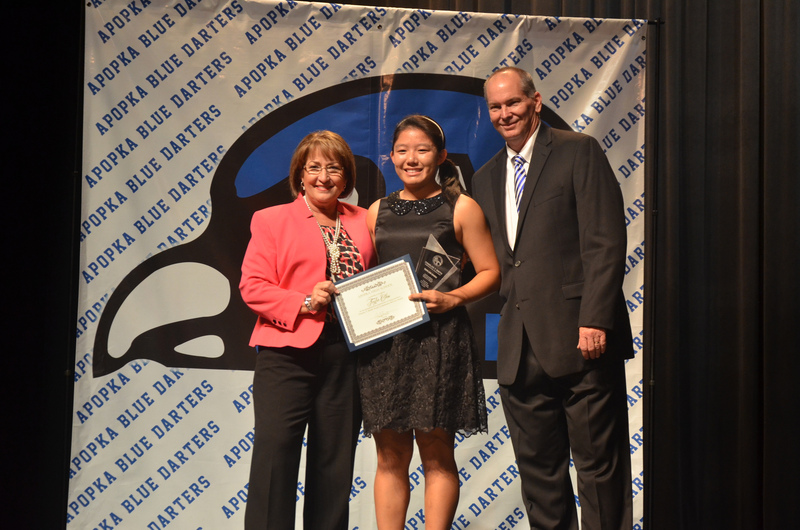 Orange County Mayor Teresa Jacobs recently recognized Apopka High School senior Taylor Chou with the Charles T. Smith Community Service Award at the Apopka High School Senior Awards Night. The award recognizes an outstanding high school junior or senior who has shown dedication toward making a positive impact in their community through service and volunteerism. The award honors the life and memory of Charles “Chase” Smith who devoted his life to public service and improving his community. Chou demonstrates a passion for community service and volunteerism and believes in helping her neighbors and the extended Orange County community. She has been most involved with the Orlando Music Club, a nonprofit organization where she helped organize community recitals at Central Florida nursing homes. Believing that music can heal, she felt empowered to help others and bring joy to nursing homes and their residents through music. She has also volunteered at Florida Hospital and tutored students in her community. Like Smith, Chou cares deeply about Orange County and is steadfast in serving those in need. Chase Smith was a fourth generation Floridian and was born and raised in Wauchula, Florida. He was a Wauchula City Commissioner in Hardee County for 12 years. Elected in 1992 when he was only 20 years old, he defeated the odds by becoming the youngest elected official in Hardee County history. Throughout his three terms, Smith worked to better his hometown by serving as the voice for the next generation of citizens, while still being able to understand and relate to the concerns and issues of the entire city population. In February 2011, Mayor Jacobs extended an invitation to Smith to join her administration as an Aide for Constituent Relations and Outreach. He rapidly learned the intricacies of a large government and in August 2011, Mayor Jacobs appointed Smith as Orange County’s first Ombudsman. Smith was selected for this role because of his extensive understanding of County government divisions and his passion to serve the community. On August 28, 2013, Chase lost his battle to cancer. To honor his legacy, the Charles T. Smith Community Service Award was created in his memory. A variety of photos from the award ceremony are available for use by the media and are located on Flickr.